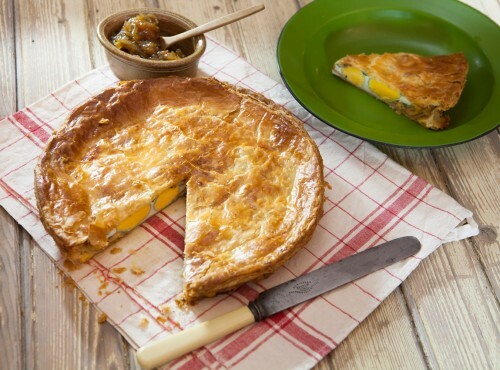 This pie is perfect picnic fare, when one needs maximum satisfaction with every bite! Preheat oven to 180°C. Line a 22 cm loose-bottomed flan tin with just over half the pastry and chill for 30 minutes. Roll out rest of pastry to make a lid and set aside. Lightly fry bacon and cut into pieces. Scatter two-thirds of the bacon over base of pastry case. Scatter with half the herbs. Break 10 of the eggs, one at a time, into a cup and slip each into pastry case, being careful not to break yolks. Season and add rest of herbs. Carefully add remaining bacon, then cover with pastry lid. Let pastry settle over the hump of each egg, then trim it and seal edges carefully. Whisk remaining egg and a pinch of salt together and brush over pastry. Bake for 35 minutes until a rich gold. Allow to cool before removing from tin. Serve warm or cold. Variation Some cooks pierce the yolks after putting the eggs into the pastry case, to achieve a more ‘layered’ pie.